My Trader Coin Review – Should YOU Join? Hey, welcome My Trader Coin Review! My Trader Coin is among the many tools getting a lot of buzz on the internet. That is why the phrase does not surprise you. You might have learned about it from your friends or family or even on the popular social media platforms, but is My Trader Coin legit or scam? You have heard about people building solid businesses with the tool. My Trader Coin is a company that makes a kind of lusterless first impression with the official website. The website does not provide any information about the company owner, its location, or the year they started operations. To get the information, you have to dig deeper outside the company website. Nevertheless, it is among one of the MLM opportunities in existence today. Alexa’s ranking for the company’s website shows that its primary traffic originates from Ecuador, Brazil, Spain, the United States and Columbia. My Trader Coin – Who is the founder? The information on Alexa is in line with the primary languages available on the company’s website – Spanish, English, and Portuguese. It indicates that the people doing the business are from one of the areas. More research shows that Andre Feitosa is a top leader of this company. Feitosa is indeed a good friend of Sann Rodrigues, the owner of another MLM program, iFreex. Earlier, Feitosa participated in the promotion of Bit Trader Banking, another opportunity, and that might be where he got the idea of starting the My Trader Coin. There are no products to sell. The company operates like others along the lines. They do not sell or market anything to the world. Alternatively speaking, you will only have the affiliate membership to market to the prospective customers. After deciding to join the My Trader Coin affiliate program, you will access the media network (known as AliveApp) and start working with a cryptocurrency called the LifeCoin. To make money with My Trader Coin, you have to invest some money (if not a lot of money) into the company. The company pays returns on the affiliate’s investment on a daily basis – they pay for 300 days in total. To benefit from the plan, you have to invest $100. Eventually, you will get $300 ROI, which the company pays out as $1 each day. The plan requires affiliates to invest $500. The company pays $1800 annually, which they payout as $6 in a day. The plan requires affiliates to invest $1000. The payout of this investment is $3600 and the company pays it out as $12 each day. The Plan 5K requires affiliates to invest $5000 so that they can receive $16,800 annual returns. My Trader Coins pays out the amount as $56 each day. Affiliates who select this investment plan invest $10000. The plan’s payout is $33,600 and the company pays it out as $112 each day. To benefit from Plan 50k you have to invest $50,000. The eventual return on the investment is $1655000 and the company pays it out as $550 each day. Affiliates are able to secure a 20% referral commission for all investments made by people they recruit. However, you have to keep in mind that all My Trader Coin investors have to pay a 10% fee –10% of the amount you have invested. What’s more, you can only pay the fee in bitcoins, nothing else. If investing in My Trader Coin sounds as a good idea to you, you have to pay between $100 and $50,000 to start earning. Is My Trader Coin Legit or Scam? Is My Trader Coin Legitimate Or a Big Scam? UPDATE: The original verdict was that My Trader Coin was a legit opportunity. However, upon further investigation and a strong desire to let you know the full truth of the company, it has been been found that they are operating as an illegal pyramid scheme. According to Wikipedia “A pyramid scheme is a business model that recruits members via a promise of payments or services for enrolling others into the scheme, rather than supplying investments or sale of products or services”. 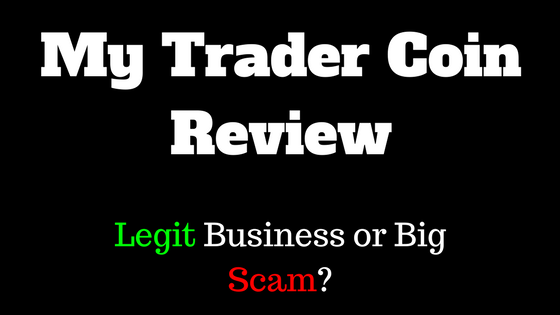 15 Responses to My Trader Coin Review – Should YOU Join? MyTraderCoin is a total scam. Unfortunately, I invested thousands in their scheme, which was too good to be true, and it was. They sent the money from my first withdrawal to encourage you to invest more, then won’t even answer why they will no longer send you your earned funds when requested. STAY clear of investing with this company!!!! HI, thanks for the information about my trader coin, it seems so interesting, but I have a question how do you know that my trader coin is legit? The review has been updated with new information about the company. They are actually operating as an illegal pyramid scheme. They have now been added to the “Not Recommended” category. I am always willing to learn of new programs out there, whether they are scams or legit. Always nice to see someone trying to weed them out and help others from getting trap in the B.S. You stated My trader coin is not a scam but I have seen systems that were legit but the revenue made didn’t justify the time spent. Do you think someone can make a good profit with My trader coin that justifies the time they spend working the business? thanks or the article .You are true mtcoin is a sensational cake in social media. I was also got exposure from my relatives about the same . I was skeptical to join it , without a reliable info. Now i can express my view to this particular opportunity. But right now i am interested in Wealthy affiliate. I assume WA is one of the best for the starters . As a newby support in the right time is a key factor to assess any new opportunity.How is the support from the officials ? Thanks for this review! I actually came across My Trader Coin when I was browsing online a while back and had no idea what it was. I am glad I found your post because you added a lot of clarity to it. I would definitely consider this as an option, but I do believe there are better affiliate options out there, especially if you are looking for a faster return on investment. Either way, not bad, thanks! Thanks for your input and taking the time to create this My Trader Coin Review. I’ve been hearing a lot of buzz around cryptocurrency. I have to agree that it does seem like a legit money making opportunity; however I don’t think it’s for me. The payouts your receive from your original investment don’t seem like an official income. It comes off as more of a long term investment versus a business opportunity. If I were to use My Trader Coin, it would be to grow my savings, not as a business venture. Thanks for your valuable and thorough information you have given us about my trader coin, actually,and like you explained about my trader coin, they also have quite impressive compensation plan for their members on board which looks very attractive. The only thing I personally don’t like about MLM companies is the fact that you would have to recruit people on board as your down-lines and also you will have to be a good marketer to be able to sell their products, before you can earn some income which is quite challenging. But I appreciate your review on My Trader Coin. Thanks for the information on My trader coin. Its interesting how the company makes its money, let alone pay affiliates. Crypto currencies are of course legit. I want to know how My trader coin is different from HYIPs though because when i look at the form of investments and pay-out model they seem the same in nature. Hmmmm yeah i think this My Trader Coin sounds pretty interesting based on your review, i mean i have some Bitcoins, and i find the whole concept of cryptocurrencies to be fascinating as realistically i think it is the currencies of the future. We have governments stacking Gold today, but in 100 years i think cryptocurrencies are really what every government in the world will hold. I want to try this mainly so i can see how good their picks are, and see if i can make some good returns with this. Thanks Jason! Well done on another great post, and for sure a lot of people will be interested in this review. I have more than a passing interest in this post as approx 2yrs ago, I purchased some shares in a company called ‘Onecoin’. I have heard nothing but bad reviews on this co. since then and there are very bad negative accounts about this business online. have you come across this company anywhere on your travels, by chance. I may do some investigations and put up a full review sometime. Thanks for letting me know about this and all the best to you. I’ve come across programs like this before. I respect your opinion that it’s legit but I don’t think this is something for me. I’ll still prefer building something that I’m actually passionate in the online world. I was scammed on a couple of HYIP programs and this sound suspicious to me. Thanks for the information some people do not know the affiliate program business in depth and fall into this type of companies that although they are legal, the only thing they want is to raise money quickly. I am part of WA, and before being part of this, I saw many sites that are not what they promise.thanks!